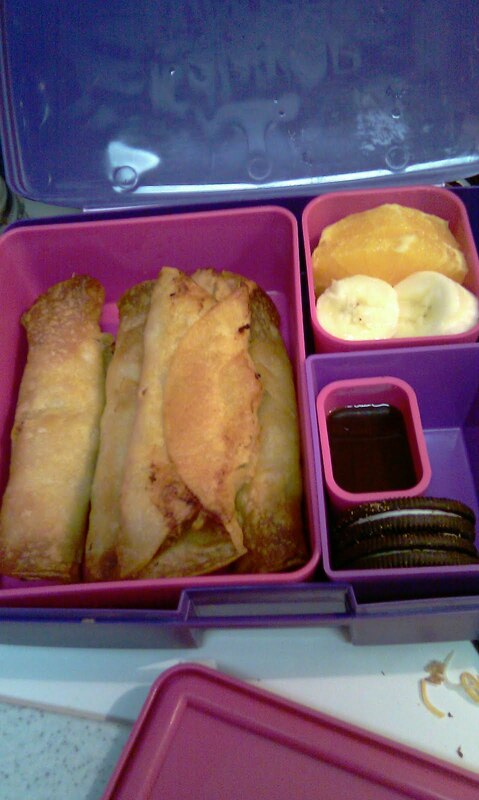 Contents: 4 homemade chicken taquitos, oranges, bananas, chocolate sauce to dip the bananas in, and Oreos. Notes: To make the taquitos I use leftover rotisserie chicken, salsa, cumin, grated cheese. soften tortillas in a little hot oil, fill, roll and bake. Those look awesome, please mail me some. Mmmm taquitos. My mom always made taquitos with leftover roast beef. Baked until crispy with sour cream and quacamole to dip it in. I honestly don't think I've ever had home made taquitos, but now I really want them. I'm with Anonymous. The kid already has Oreos, whats he need chocolate sauce for? He's prob gonna dish the fruit and dip the Oreos in it anyway.